Fontself Maker for Photoshop requires a copy of Photoshop version CC 2015.5 or newer. It will NOT run on previous versions like CC 2014, CC or CS6. Quit Photoshop if it’s already running. Double click on the icon Install Fontself Maker for Photoshop.pkg and proceed with the installation instructions to setup Fontself. Launch the Photoshop version in which you want to install the Fontself extension. Double click on the file Install Fontself Maker for Photoshop.exe and proceed with the installation instructions to setup Fontself. If you have multiple versions of Photoshop (like older CS6 ;) launch the Photoshop CC version in which you want to install the Fontself extension. Got an empty extension panel after loading the extension? => On CC 2015, just click on the top right drawer icon & select “Reset Extension”. If it keeps failing, quit Photoshop & restart the extension (wait a few more seconds when the extension loads again). Got a spinner that keeps spinning above your extension? => There might be a bug! 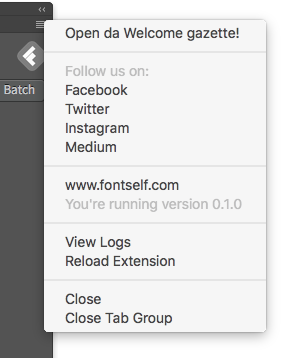 Just close the extension and reload it from Window > Extensions > Fontself Maker (you can also click on the top-right menu drawer and press Reload Extension). If you can reproduce this problem again, please let us know when it occurs and send us the logs file that you will find in View Logs / Send Logs). On how many computers can I install the Fontself extension? >> Your personal license allows you to install the extension on 2 computers you use (like on a desktop and a laptop), as long as you are the sole user of this extension. May I install the extension on both a Mac & a PC? >> Yes, as long as you are the only one who uses them.